My first large format camera was a Wisner 4 x 5 Pocket Expedition, purchased in December 1999. After using it for half a year, I began to dislike it more and more...IMO it was poorly designed and poorly constructed…the back would pop off upon removing a film holder, gears would jump from their track if focused a bit too far, and numerous other problems. Finally I decided that there must be a better solution; after discovering Ebony during purchase research, I found that solution. The Ebony factory is located in Japan, and makes a range of field cameras from "baby" 2 x 3 to 8 x 10. They are built to the highest standards of ebony wood (with a few mahogany models) and titanium, impeccably finished and superbly designed. Ebony cameras are not cheap, but the quality put into each camera is obvious, and I consider the price difference to be a very worthwhile value. What a difference from the Wisner…I've been thrilled with the Ebony since it arrived. This will not be a lengthy review of view camera movement capabilities and the like. Suffice to say that the SV45U2 has more room for movement than some studio view cameras, and I have yet to discover a situation where it lacked the ability to do what I wanted it to do. It has 590mm of bellows extension, enough for an 800mm telephoto, and will focus to infinity, amazingly, with lenses as short as an ultra-wide 35mm. Although purchased for landscape use, I have occasionally used it for studio flower portraits in the macro range with excellent results. As Ebony's informational text says, their cameras are extremely rigid. Definitely true! After the Wisner experience, I had doubts that any wooden camera wouldn't sway and twist when inserting or removing a film holder. Not the Ebony…it is rock solid even at full extension, and once I've locked it into position, I can be confident that it's not going anywhere. One of the best features of this model is the ability to do asymmetrical tilts. 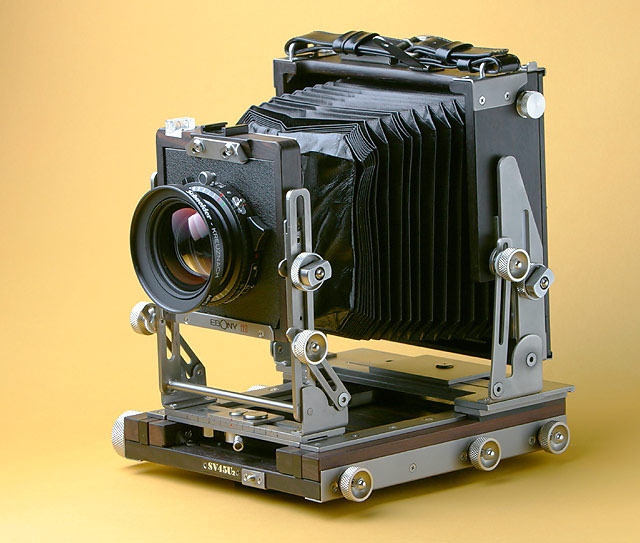 Briefly, most large format cameras allow base tilt, axis tilt, or both. After tilting, focus usually must be readjusted, often multiple times before getting it right. With asymmetrical tilt, one merely focuses along the lower dotted line of the ground glass, then adjusts tilt until the focal plane lies in the proper position according to a dotted line opposite the first one. Voila! Perfect focus, quickly and easily. It works for swing in the same way. The camera is filled with thoughtful touches, such a dual bubble level topped by a hinged mirror; no standing on a rock or chair to check the level on those occasions that the camera is high above ground. It also includes an excellent Fresnel lens; very bright and easy to focus, even with wide-angle lenses. A separate wide-angle Fresnel is also available; perhaps I would have one if I worked with wide-angles extensively, but so far the normal Fresnel has worked well for me. My focal length coverage ranges from 47mm (super-wide) to 720mm (for 4 x 5, a very long focal length, with similar angle of view to a 216mm lens in 35mm format). Ebony will customize a Horseman binocular reflex viewer to fit its cameras; another big plus, since one can then compose and focus a "correct" image rather than one that is inverted and reversed, and it also does away with the need for a darkcloth in most instances. Unfortunately, the Horseman viewer is no longer made, but they can occasionally be found on the used market. Alternately, I highly recommend the "tube style" BTZS darkcloth in preference to the old-style square "horseblanket" cloth. The SV45U2 is certainly the most pleasant-to-use, beautifully made large format camera I've seen or used. I can't think of a single thing that I would change, and once having used it, I would not be satisfied with anything lesser. Feel free to email me if you have particular questions about the camera or its use; if you are presently shooting with this camera, please keep my drum scanning service in mind! Update: I'm sorry to say that as of June 2016, Ebony has ceased operation, presumably due to decreasing demand for film cameras.